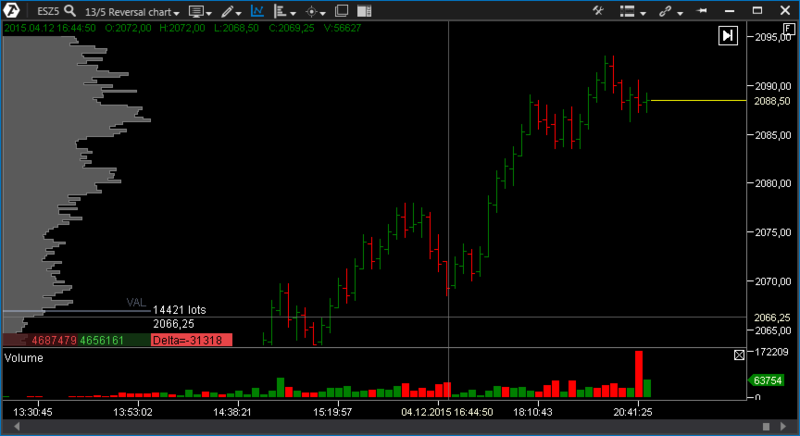 Chart periods and types are customizable in the ATAS platform. In addition to standard time slots, you can select other types of intervals with different settings. 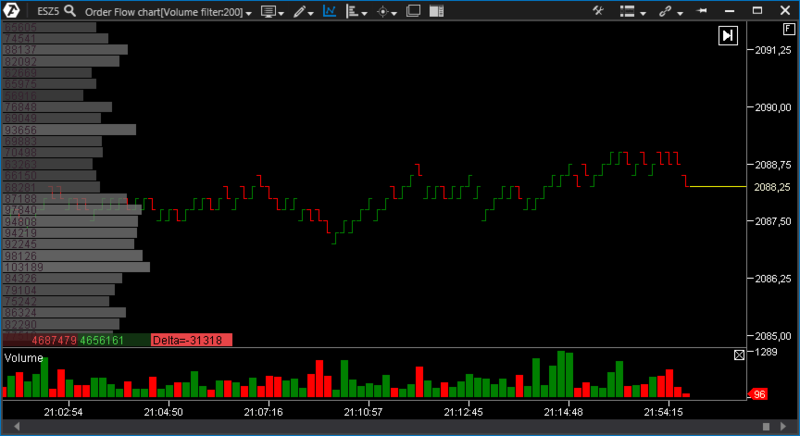 The timeframe and the chart type can be adjusted by one left-click on the icon on the chart menu bar and select the desired timeframe or chart type in the pop-up menu. 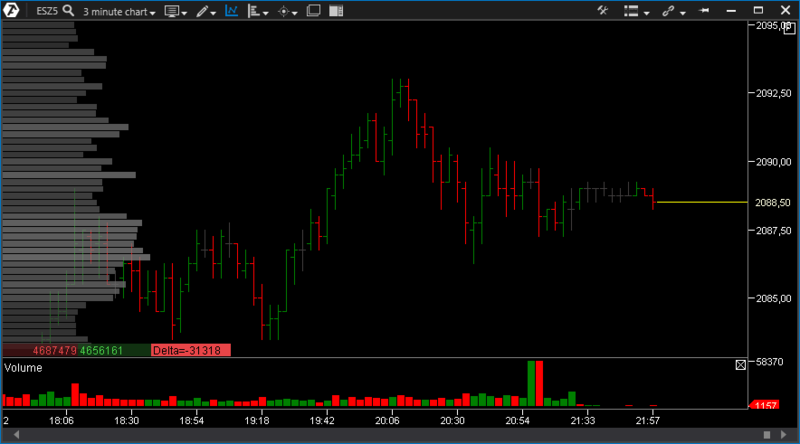 To set the period or type of chart, press Configure . 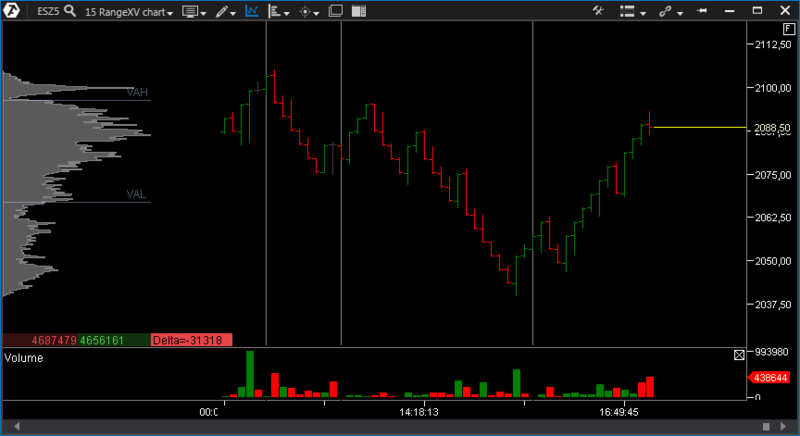 Each kind of chart can be placed above or below using the Up and Down buttons (in the screenshot 1 and 2), and also customize it according to your requirements. In the Timeframe line, select a value from the drop-down list or Custom if you want to enter a value that is not in the list. Then enter the desired parameter in the line below. Minute - this option indicates the bar is built according to the selected time period value of 5 m, 15 m, 4 h, etc. 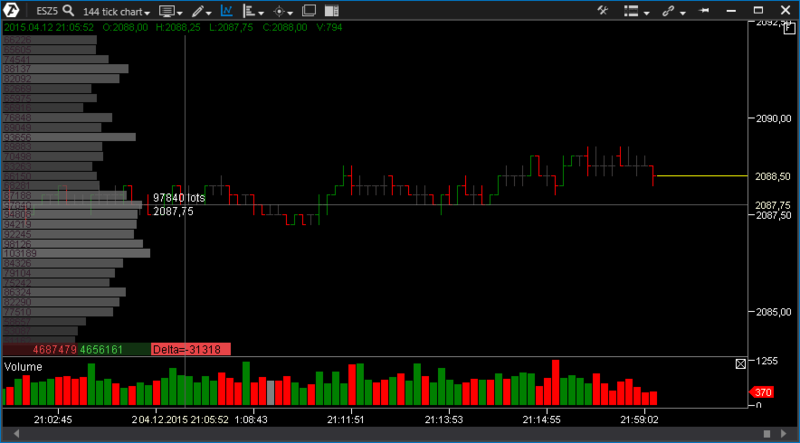 For example, if the value of 3 is selected, the new bar on the chart will be formed with 3-minute intervals. Seconds - similar to the Minute settings. The chart will be created according to the selected value. If the value of 45 is selected, each bar will corresponds to a period of 45 seconds. Tick - a tick chart based on a certain number of ticks in a bar. That is, if the value of 144 is selected, one bar will be formed after every 144 trades; these trades may include both small and large orders. Each trade will be counted only once regardless of its size. 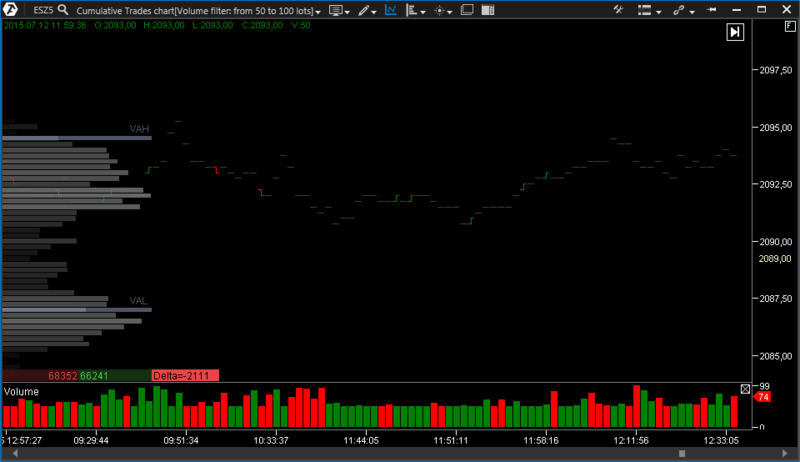 Thus, a chart with a uniform distribution of trades by bars is formed. This chart type is especially interesting in combination with volume indicators to assess the volume structure, to determine the activity of major players, and to analyze the price reactions to this activity. When configuring the volume intervals, do not forget to relate them to the instrument's liquidity a large volume for actively traded instruments can be higher than for non-liquid instruments. 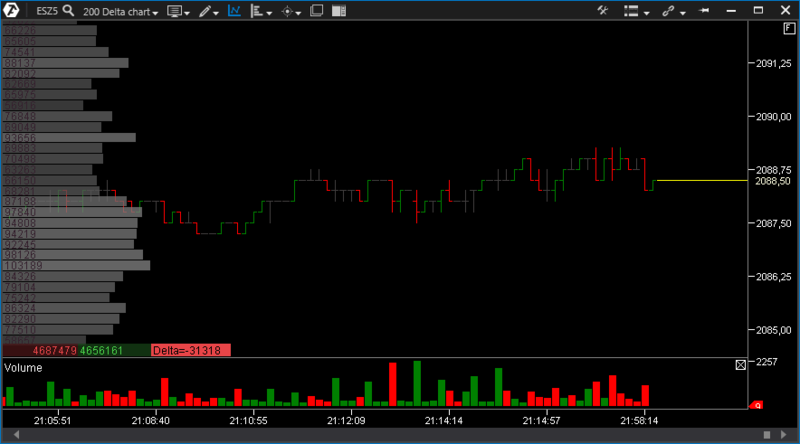 Delta - the delta-type chart means that each bar is formed if the difference between the volume of traded asks and bids corresponds to the selected value. Let us use the value of 200 as an example.Each bar on this chart is formed only after the difference between the purchase volume and the sales volume reachesthe value of + or -200 (build), i.e. upon the creation of a certain imbalance between buyers and sellers when one side dominates the other. In conjunction with volume indicators (Volume, ClusterSearch) we can estimate the intensity of the struggle between buyers and sellers that has resulted in such an imbalance. And if we relate the constant delta to the price movement, we will be able to see the power of this movement and the level of resistance in this case. Range - a classic range chart, the main task of which is to get rid of the so-called market noise, i.e. minor price fluctuations that have no value and only complicate the analysis of the trade situation. 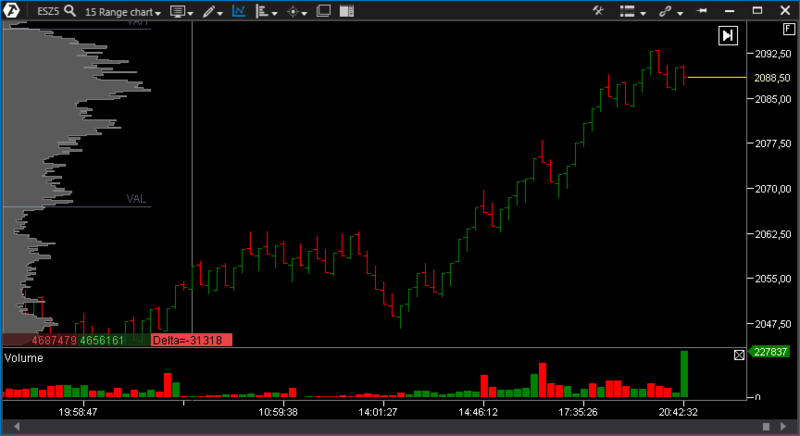 To form a range bar in this chart, the price has to go a given distance regardless of how long it will take. 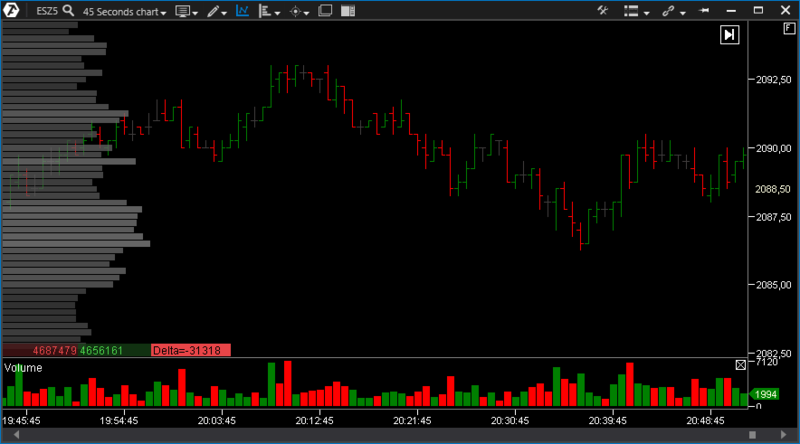 For example, if we select the value of 15, it will mean that each new bar will be built only after the price overcome 15 ticks up or down.The chart of range bars allows traders to analyze market volatility. The advantage of range charts is in that consolidation periods will result in smaller bars and vice versa... This will eliminate the market noise. (RangeX) (RangeXV) (RangeUS) (RangeZ) - these types of frames are different modifications of classic range charts and are aimed at eliminating their various drawbacks. At this point, we cannot disclose the algorithms of their formation due to our agreement with the author. After monitoring their formation process for a short while, you will easily understand their distinction from others and their benefits! These range charts are left in the public domain at the request of our customers and will be probably described in more detail in the future. Reversal - for the formation of this bar type, the price must overcome over a certain distance and then roll back to the predetermined value. 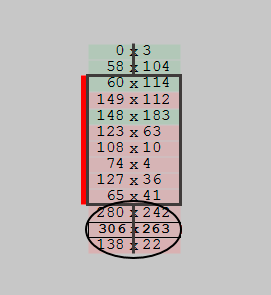 If we select the value of 5 and the probe of 13, this will mean that the formation of all bars in the chart requires a rollback of 5 ticks after the minimum height of 13. In this case, pay attention to the distribution of the volume in the bar; namely, which part of the bar contains the volume center (the unit with the maximum volume) and, most importantly, what the reaction was to this volume: forcing on the volume or rebounding from it. For this, the Reverse chart should be used in conjunction with the cluster display of the chart. Order Flow - (it is similar to the spread tape, but in the graphical form). This parameter shows the distribution of volumes in each spread. This method of displaying the tape is useful because it allows seeing the balance between buyers and sellers and who has the initiative more clearly. 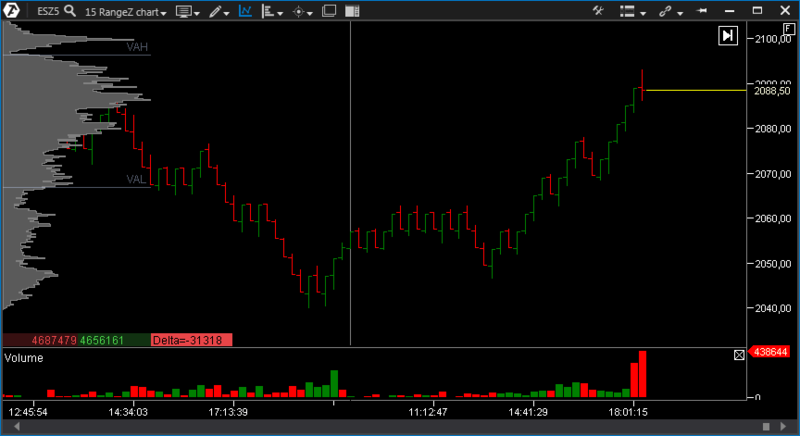 * In addition to that, a filter to display clusters with the volume above the preset value, which has been traded in the spread, can be configured in the settings of this chart type. For example, if the select the value of 200, only the bars that have a minimum volume of 200 contracts will be formed. BTK chart - It is another modification of a Range chart. The BTK candles are built by a great mathematics formula that makes an optimum filter of the “market noise”. Unfortunately, under NDA (Non-Disclosure Agreement), we cannot disclose the principles their authors have put into building these. There are a few unique parameters that make those charts different from a classic range chart. Cumulative Trades - in fact, this parameter is the same as the Tick cluster (i.e. a print tape); but here, the tape is shown in the form of a chart. The calculation is performed similarly to the Smart Tape module, but the data are presented in the form of clusters. Such an innovative approach to mapping the flow of transactions makes it easy to accept all incoming information. While the tape requires looking into figures to determine order prices, everything is seen in the dynamics directly on the chart. * In addition to that, filtering by minimum and maximum volume is available. 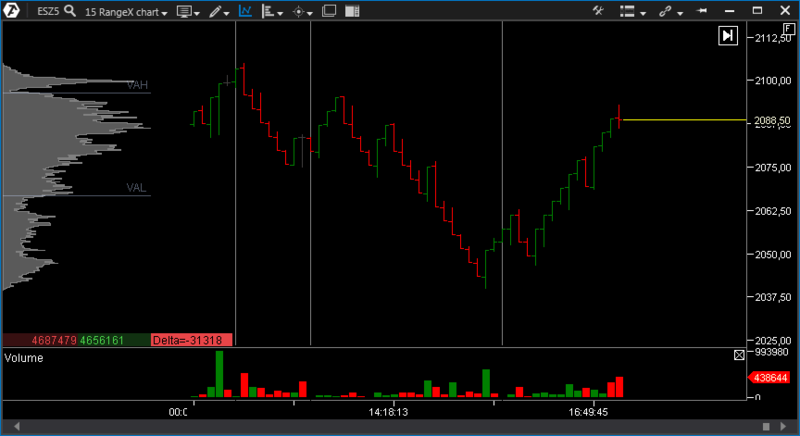 Bars will be built on the chart only when they fit in the predetermined transaction volume range in contracts. This way you can see the dynamics of traders' transactions with different capitalization. 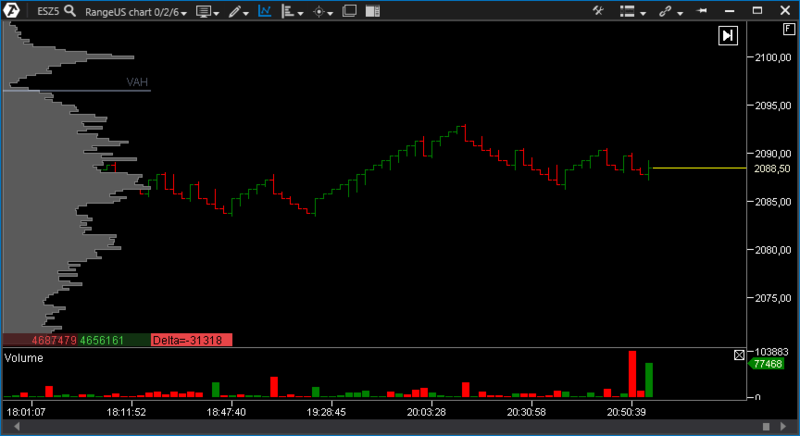 Renko is a way of displaying prices that takes into "clear movement" without the time factor.